How Do You Factor a Polynomial by Guessing and Checking? Factoring trinomials can by tricky, but this tutorial can help! Follow along as a trinomial is factored using the guess and check method. What, no possibilities work? The trinomial must be prime! Watch this tutorial and see what happens! How Do You Figure Out a Template for Factoring a Trinomial? Did you know that when you're factoring a trinomial, the signs in the trinomial determine the signs in the product of the binomials? This information is really useful when you're factoring trinomials! Watch this tutorial and learn the different sign cases. If you learn about algebra, then you'll see polynomials everywhere! In this tutorial, you'll learn the definition of a polynomial and see some of the common names for certain polynomials. How Do You Use the Zero Product Property to Find Solutions to an Equation? Learn how to put the zero-product property into action by watching this tutorial! First, identify the factors in the expression. Next, use the zero-product property to split these factors into separate equations. Finally, solve each equation to get the solutions to your original equation! How Do You Figure Out What Factoring Strategy to Use? When your trying to factor a polynomial, one of the most difficult tasks can be determining the correct factoring strategy. 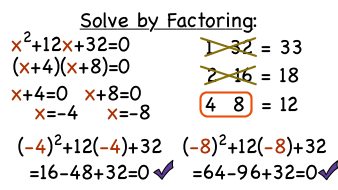 Luckily, this tutorial provides a great strategy for factoring polynomials! Check it out and always know how to approach factoring a polynomial! One of the many ways you can solve a quadratic equation is by graphing it and seeing where it crosses the x-axis. Follow along as this tutorial shows you how to graph a quadratic equation to find the solution. Check it out!